iTECH provides technology services to schools (and also to libraries, ISP's, hospitals, clinics, governmental agencies, manufacturers and commercial operations). Our commitment is to making the technology actually contribute to the goal of education of children and young adults. While Microsoft has dominated the school desktop, Unix has been the language of the Server/Network function. iTECH Inc. has been focused for the past fourteen years on providing and supporting that server functionality in Schools and other environments. We have provided consulting support for small to large districts for Unix support needs. Specifically, we provide our customized solutions for schools who have needs that are not met by the existing package solutions. Monopolistic license prices and virus vulnerability make the Microsoft desktop a problem solution. More and more Linux products are moving to the desktop. Many governement and business organizations are putting free "Open Office" on their desktops. 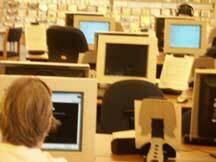 We offer technical support your school or organization needs to move in this direction. iTECH has observed the that expanded technology doesn't automatic generate good education. We have become involved in several projects that promote education via digital technology. We are involved with a group of entrepenurial companies that seek to develop educational tools from web portals to generating games for the classroom.